It seems that my love for paneer would see no bounds. I just love them and love stacking up them in my refrigerator. My first intro to this dish was during my 12th std holidays when me and my dearest friend Mythreyee had gone to meet Priya a senior to us to attend her engagement party. We all had a gala time and the food……. I for one who loves panner so much just could not forget the taste of this dish supplied by the caterers. Ever since then when ever I have a chance to eat out, especially a dhaba, my choice would always be roti and matar panner butter masala to go with it. After my marriage whenever hubby dear gets to attend an evening meeting with his clients in any restaurant, he without fail would bring me a parcel of this dish on his way home after calling me to make just rotis saying the side dish is one the way. After much trial and error I learned to make this dish in a very easy way in my home itself without missing out the taste of eating out. In a kadai, melt the butter. Add the paneer cubes and shallow fry till they are golden brown. Take the paneer cubes and keep it separately. In the same kadai sauté the cubed onions and the green chilies till the onions turn golden in color. Add the fried paneer cubes that you have kept separate to the sautéed onions and keep the kadai aside. Take another pan and heat the oil, add the ground masala paste and cook till brown. Now add the chilli powder, tomato puree and cook for a few minutes. Add the cumin powder, garam masala powder and ½ cup water and cook till the oil separates from the masala. 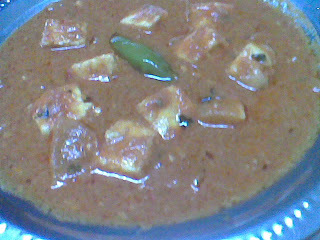 Pour this tomato gravy into the kadai that already has paneer cubes. Now add the boiled peas along with milk, cream, sugar and salt and let it come to a boil. Cook for 10 minutes. You can use butter instead of oil to make the tomato gravy if you don’t mind the calories. Note: I used 3 big ripe tomatoes to make the puree. Oh and also if you don’t have cream, not to worry replace it with milk instead. Though kasuri methi is optional it really gives the dish a superb flavor. So don’t miss adding it if u have it in your pantry.